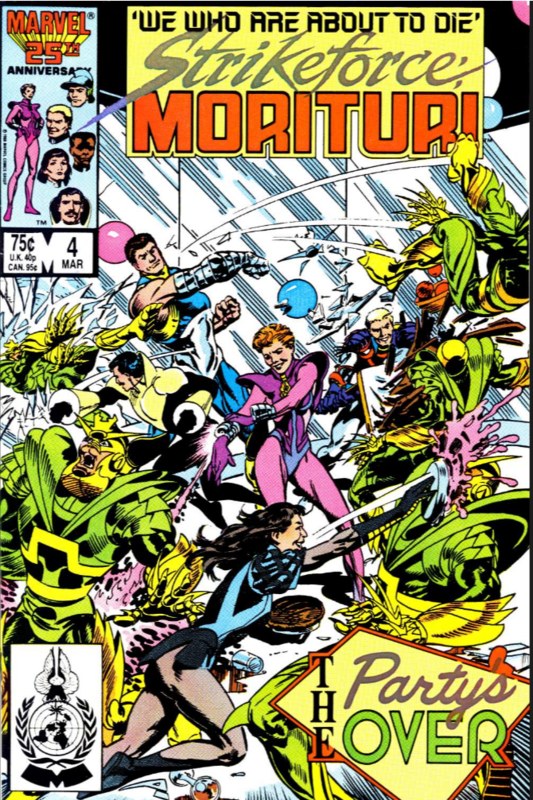 Strikeforce: Morituri #20 came out in March of 1988. It would have been cold in Ohio then, but it wouldn’t have stopped me from riding my bike the two miles from my house to the News and Photo Shop, a jack of all trades store that processed photos, sold newspapers, had an extensive selection of cigars and tobacco, and also had two racks of shelves that held new comics. That’s all News and Photo had with regards to comics; if a book had been out for more than a month or two, it disappeared. I never knew where they went, but they were no longer on those wooden magazine stand shelves. Space had to be made for the new comics. News and Photo smelled like paperbacks and pipe tobacco. It’s the greatest scent I have ever known. There was an overhang above the sidewalk outside the New and Photo Shop and it more or less held the snow at bay. I would leave my ten speed on that side walk, in that strip mall, spend way too long inside debating which comics I should spend my allowance on, then come back outside and sit next to my bike and read them. Hundreds of people must have walked past me over the course of my time getting my comics there. It was always exciting. I loved comics, I loved new comics, I loved the freedom that came with riding my bike and dictating how I spent my time and money. That day in March of 1988 was different. I had been reading comics for just over two years. I had never read a comic book that made me cry, not until that day in March. 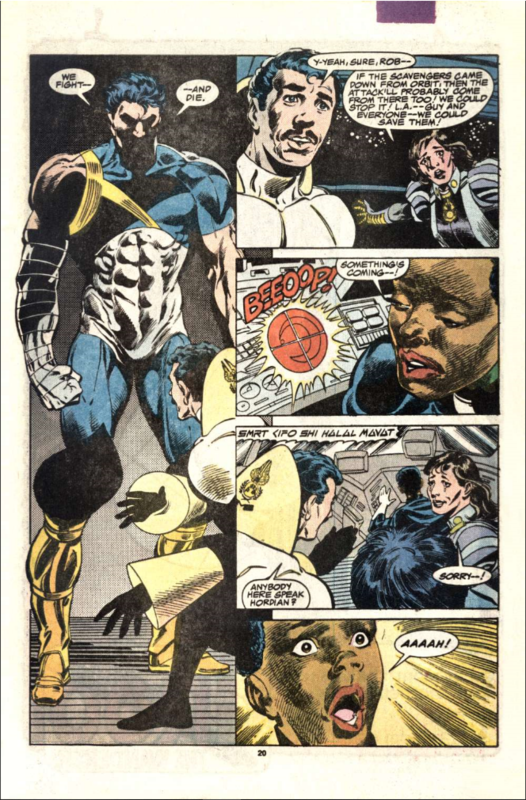 I sat there on that concrete sidewalk, bundled in my winter coat and stocking cap, snow melting in the parking lot, strangers walking past me, and I got to the last page of Strikeforce: Morituri #20 and my eyes welled up. I did not discover Strikeforce: Morituri. My best friend at the time, Matt Harrington, discovered Strikeforce. He’d bought issue #4 and, as was our way, given it to me to read, probably in exchange for an issue of X-Factor or New Mutants. It only took one issue to hook me. Strikeforce: Morituri, created by Peter B. Gillis and Brent Anderson, takes place in the year 2069. It didn’t take place in the Marvel U, although it was published by Marvel, which was bizarre given that Epic was up and running at this time. The quick and dirty story of the Strikeforce is this: In the future, Earth is invaded by aliens known as the Horde. They overrun much of the planet (which, by this point, is run by a global government) and turn thousands upon thousands of humans into slaves. They have the numbers and they have the technology. But there’s hope! Dr. Kimmo Tuolema created a process that could give human beings super powers, but the process would also kill them in roughly a year’s time. Strikeforce was a war comic and it was a character study. It was rarely a superhero comic. The intensity if ramped up by the fact that, while we know these characters will all eventually die, we don’t know when. That meant that in any given issue, the characters we’ve come to know and love could shuffle off the fictional mortal coil. You might think that would have prevented me from getting invested, but just the opposite. Gillis and Anderson played up the conflicting emotions of the characters enough so that it felt real, but not so much to make it feel hyperbolic. Gillis and Anderson made sure that the intense emotions had a basis in the events of the book, and they did that by killing character off on a regular basis. That would have been enough, but they also loaded the books with interpersonal drama, from troubled relationships, second thoughts, spiritual questions, and issues of morality and loyalty. Our POV character is Harold Everson aka Vyking. He was an emergency volunteer and aspiring writer and he narrates issue #20 post-mortem. That’s not a spoiler; I’m serious when I say that everyone eventually dies. What matters is how they live. And each of the characters goes a different route. Some go primal. Some try to find a cure. Some live their lives to the fullest. Some are frozen with fear. Simply volunteering for the process and getting powers isn’t enough to make any of these characters a hero, although it could. Their sacrifices are contextualized by what they do with the limited time they have. There’s more to the series than just those who go through the Morituri process. There’s governmental red tape. There’s military machinations. There are even stories about the Horde, delving into their culture and history. But in the end this is a story about people who make a courageous choice and the human responses to that choice. There’s lots of violence, bloodshed, and death, but there’s even more genuine human emotion. Strikeforce:Morituri last for 31 issues as a monthly comic, then another five in a limited series called “Electric Undertow.” Gillis, Anderson, and inker Scott Williams are the primary creative team for the first 20 issues and the book plunges quickly after they leave. James Hudnall takes over as writer, eventually joined by newcomer Mark Bagley as penciler. Gillis and Anderson created Strikeforce:Morituri and as such were the ones who best understood it. To his credit, Hudnall tries to make changes to the book so that it becomes something different, something he can make his own, it just pales in comparison to what came before. 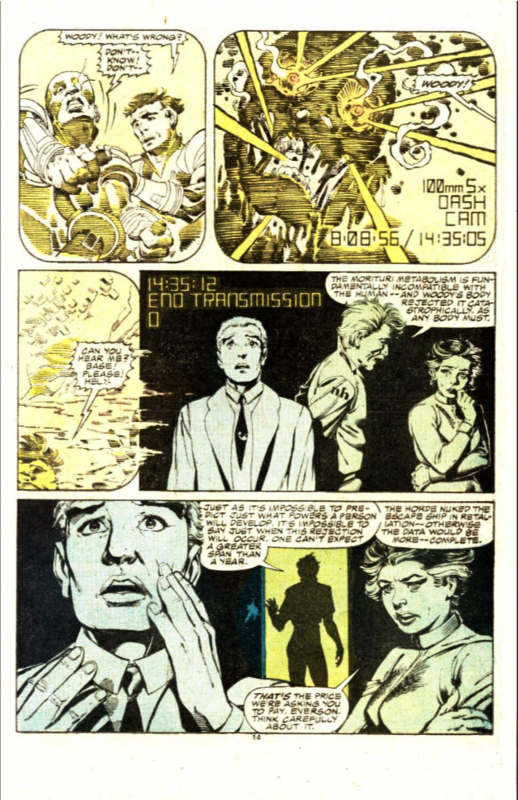 Anderson pencils 17 of the first 20 issues. Two issues are penciled another newcomer, Whilce Portacio. 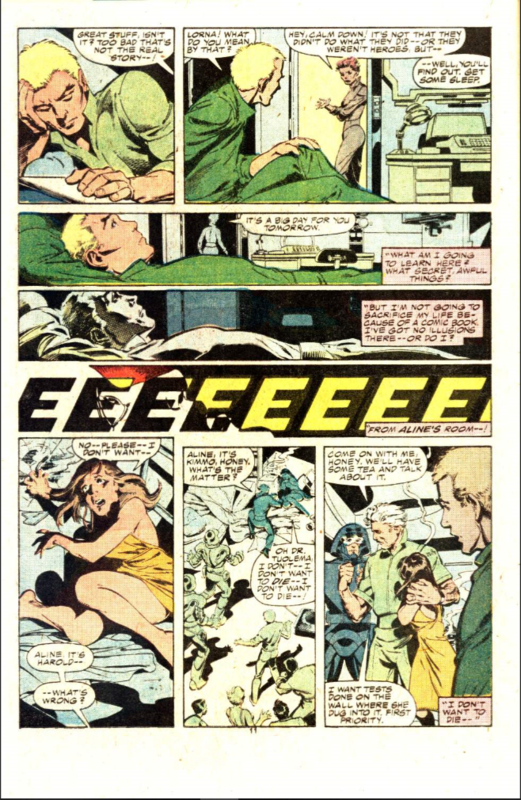 Wiliams inks all but one issue (inked by Al Williamson) and he also pencils an issue. I think this is the only comic I’ve ever read with Williams doing pencils and inks and it’s great — some obvious influences from the famous pencilers he regularly inks with a solid dose of Michael Golden to boot. Anderson’s work on this book is essential. He gets a lot of credit for his storytelling abilities, his sense of place and action, but he doesn’t get nearly enough accolades for how unique each of his characters is. Besides simply body type and motion, the detail and variety that Anderson gives to faces is second to none. You could teach an art class with these comics. That’s not to sell the character designs short. The initial reason the book appealed to me was because the characters looked so damn cool, like superheroes, but not. The entire series is collected into 3 trade paperbacks and, unfortunately, the second collection also includes six issues of the post-Gillis/Anderson/Williams era, but you really need all of the 1st 20 issues to appreciate the series.